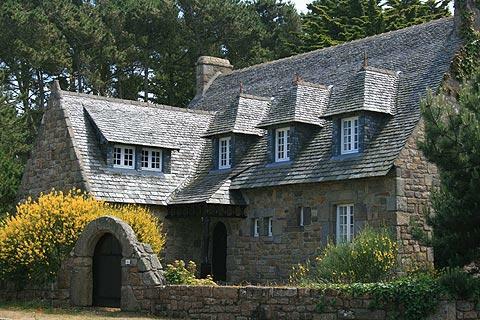 Tregastel is a small seaside village on the scenic Coast of Granite Rose of northern Brittany in two parts a couple of kilometres apart: the historic village to the east and the coastal resort of Trégastel Plage to the west. The village has some lovely architecture and a pleasant beach - the Quay St Ann. On the shore be sure to take a look at the tidal mill, an eco-friendly mill dating from the early 18th century. A notable building in the village is an interesting small chapel called the Chapel of Sainte-Anne-des-Rochers which inside has a wooden ceiling resembling an upturned boat - very fitting for a seaside church. 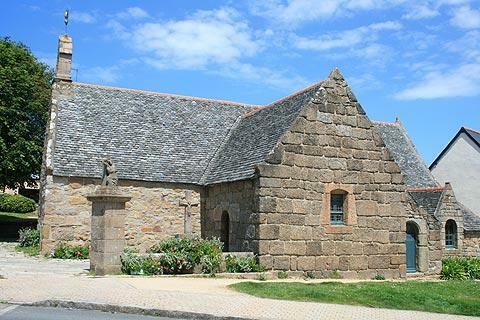 The main church in Tregastel, the Church of Saint-Anne, is also interesting and in part dates from the 12th century although numerous additions have been made later including a 17th century ossuary to store bones of skeletons when space ran out in the cemetery. 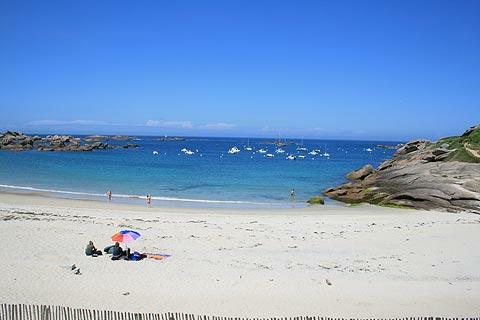 It is for the natural scenery that visitors are attracted to Tregastel - there are several beaches close to hand, and the contrast between the pink granite boulders and islets, the shimmering blue of the sea and the yellow of the beach combine to create a very lovely setting. The principal beaches are called Plage de Grève-Blanche and Plage du Coz-Pors (the main beach). The buildings behind the beach are not the most lovely we have ever seen but the coast and beach are so picturesque that we hardly noticed, and more recent buildings such as the entrance to the aquarium are extremely well integrated into the environment. 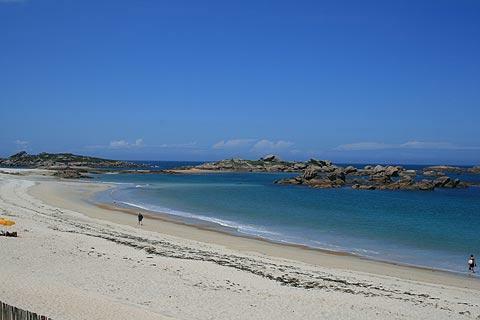 A coastal walk - the Sentier des Douaniers - passes by Tregastel Plage and is an excellent walk to see more of the lovely pink granite coast, as well as the countryside: see also the guide to the Coast of Granite Rose. You have more chances to appreciate the natural environment if you take one of the organised boat trips around the group of islands just off the coast called the 'archipelago of seven islands' - bring your binocular, this is the largest bird sanctuary in France. History enthusiasts will also want to travel a few kilometres south from Trégastel-Plage to Kergentuil and the Ile Grande to see the prehistoric gallery grave and dolmen.